Printed twice under the base, which serves as a stand for the flask, are the images of the two ducks. 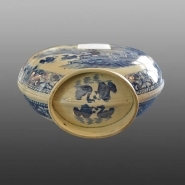 A rare named and dated earthenware flask printed in blue with an unrecorded chinoiserie pattern. It features a house near water beside which are seen two ducks, one diving, the other floating. Incised underglaze on the flask are three lines: "July 14" over "1807" over the name "Thomas Osborn".